Approximately 500 Tg of isoprene are emitted to the atmosphere annually, an amount similar to that of methane, and despite its significant effects on the climate, very little is known about the biological degradation of isoprene in the environment. Isolation and characterisation of isoprene degraders at the molecular level has allowed the development of probes targeting isoA encoding the α-subunit of the isoprene monooxygenase. This enzyme belongs to the soluble diiron centre monooxygenase family and catalyses the first step in the isoprene degradation pathway. The use of probes targeting key metabolic genes is a successful approach in molecular ecology to study specific groups of bacteria in complex environments. Here, we developed and tested a novel isoA PCR primer set to study the distribution, abundance, and diversity of isoprene degraders in a wide range of environments. The new isoA probes specifically amplified isoA genes from taxonomically diverse isoprene-degrading bacteria including members of the genera Rhodococcus, Variovorax, and Sphingopyxis. There was no cross-reactivity with genes encoding related oxygenases from non-isoprene degraders. Sequencing of isoA amplicons from DNA extracted from environmental samples enriched with isoprene revealed that most environments tested harboured a considerable variety of isoA sequences, with poplar leaf enrichments containing more phylogenetically diverse isoA genes. Quantification by qPCR using these isoA probes revealed that isoprene degraders are widespread in the phyllosphere, terrestrial, freshwater and marine environments. Specifically, soils in the vicinity of high isoprene-emitting trees contained the highest number of isoprene-degrading bacteria. This study provides the molecular ecology tools to broaden our knowledge of the distribution, abundance and diversity of isoprene degraders in the environment, which is a fundamental step necessary to assess the impact that microbes have in mitigating the effects of this important climate-active gas. Isoprene (2-methyl-1, 3-butadiene) comprises approximately one third of the total volatile organic compounds (VOC) emitted to the atmosphere, an amount that is approximately equal to emissions of methane [1, 2]. Although isoprene has a short lifetime in the atmosphere (in the order of hours) due to rapid photochemical oxidation , it has a significant impact on atmospheric chemistry and hence climate . In unpolluted environments with low levels of nitrogen oxides, isoprene reacts with hydroxyl radicals, thus reducing the oxidising capacity of the atmosphere . This, in turn, prolongs the lifetime of greenhouse gases such as methane and enhances global warming [4, 5]. In polluted environments, nitrogen oxides are typically present at high concentrations and react with isoprene, leading to the formation of tropospheric ozone , which is a greenhouse gas with important negative effects on plant and animal health . Conversely, atmospheric oxidation of isoprene results in the formation of secondary organic aerosols and cloud condensation nuclei, which in turn promotes global cooling [7, 8]. The vast majority of isoprene emitted to the atmosphere is produced by terrestrial plants (~ 500 Tg year−1) [2, 9], with small contributions from marine algae (0.1–12 Tg year−1) and minor contributions from bacteria, fungi and animals [10–17]. Isoprene is also produced industrially (~ 0.8 Tg year−1), where it is used primarily to synthesise polyisoprene rubber . In plants, isoprene is synthesised in the chloroplast from dimethylallyl diphosphate (DMAPP), an intermediate of isoprenoid biosynthesis, in a reaction mediated by isoprene synthase . It has been shown that isoprene protects plants against heat and oxidative stress [9, 20] and it has also been suggested that it might have a role in plant-insect interactions  and plant energy dynamics . However, not all plants produce isoprene, with both high and low emitters being observed even among closely related species [23–25]. Although atmospheric levels of isoprene are low (1–4 ppb) , due to its high reactivity, concentrations are significantly higher (up to 36 ppb) at ground level in high isoprene-emitting forests . Closed chambers and continuous-flow experiments have shown that soils can act as a biological sink for isoprene at environmentally relevant concentrations [28–30]. These studies confirmed the potential for soil microbes to consume isoprene released locally in soils as well as from the atmosphere. In fact, bacteria that grow on isoprene as sole carbon and energy source have been isolated from soils, leaves and coastal/marine environments [31–37]. These isolates are mainly Actinobacteria, although recently more Alpha- and Betaproteobacteria strains such as Sphingopyxis sp. OPL5 and Variovorax sp. WS11 have also been isolated . All known isoprene degraders contain six genes (isoABCDEF) encoding the isoprene monooxygenase (IsoMO) that catalyses the first step of the isoprene degradation pathway. Four additional genes, isoGHIJ, are located immediately upstream (5′) of the IsoMO structural genes and encode enzymes involved in the subsequent steps in isoprene catabolism [32, 33, 39, 40]. The IsoMO is a four-component soluble diiron monooxygenase (SDIMO) composed of a dimeric hydroxylase, a NAD(P)H oxidoreductase, a coupling protein and a Rieske-type ferredoxin. Other members of the SDIMO family include the soluble methane monooxygenase (sMMO), alkene monooxygenases, phenol hydroxylases and aromatic monooxygenases, which are key enzymes in the bacterial oxidation of hydrocarbons and have biotechnological applications [41, 42]. In addition, structural and genetic analyses have revealed that the hydroxylase α-subunit of SDIMOs contains a carboxylated-bridge diiron centre in a distinctive 4-helix bundle structure at the active site (reviewed in ). The IsoMO catalyses the initial oxidation of isoprene to 1,2-epoxyisoprene (Fig. 1). The epoxide is converted to 1-hydroxyl-2-glutathionyl-2-methyl-3-butene (HGMB) by a glutathione S-transferase (IsoI) and then by a dehydrogenase (IsoH) to 2-glutathionyl-2-methyl-3-butenoate (GMBA) . The fate of GMBA is uncertain. It is assumed that subsequent removal of glutathione and β-oxidation of these intermediates enable isoprene degraders to grow on isoprene as a carbon source but the final steps in the catabolism of isoprene remain to be elucidated. The identity and availability of genes essential for isoprene metabolism provide tools for cultivation-independent studies to assess the distribution, diversity and activity of isoprene degraders in the environment. Gene probes are important molecular ecology tools to study functional groups of interest in complex environments. For example, primers targeting genes encoding key subunits of particulate and soluble methane monooxygenase (pmoA and mmoX, respectively) have been used to extend our knowledge of the diversity and abundance of methane-oxidising bacteria in many environments [43–46]. The isoA gene, encoding the α-subunit harbouring the active site of IsoMO, is highly conserved in all isoprene degraders studied and is a suitable marker gene for isoprene degradation . Primers targeting isoA, tested negative with genes encoding the corresponding active site of SDIMOs from non-isoprene degraders, but amplified isoA from extant isoprene-degrading bacteria and from a range of environmental samples enriched with isoprene, generating sequences which were > 86% identical to those of bona-fide isoprene degraders . However, the increasing number and variety of isoprene degraders has revealed a higher diversity of isoA sequences, which emphasises the need to refine isoA primers to cover all the isoprene-degrading strains characterised to date. Here, we designed new isoA primers that amplified isoA genes from all extant isoprene degraders, but did not amplify isoA homologues of related enzymes from non-isoprene degraders. These new isoA probes were then used to investigate the distribution, diversity and abundance of isoprene degraders in phyllosphere, soils, freshwater and marine environments to better understand their role in the isoprene biogeochemical cycle. In order to cover the diversity of all well-characterised isoprene degraders, we designed new probes targeting isoA, as this gene encodes the α-subunit containing the active site of the IsoMO and is an excellent marker gene for isoprene degradation . We aligned the isoA genes from 38 bona-fide isoprene degraders available from Genbank and strains recently isolated by our group (Additional file 1: Table S1). Microorganisms included in the analysis belonged to the classes Actinobacteria (e.g. Gordonia, Mycobacterium, Rhodococcus), Alphaproteobacteria (e.g. Sphingopyxis) and Betaproteobacteria (e.g. Variovorax). Eighteen isoA sequences detected in the metagenomes from isoprene enrichments of willow soil, willow leaves and poplar leaves (unpublished data) were added to the isoA database to design the new probes. These metagenome-derived sequences had a minimum query coverage of 98% and an identity of ≥ 85% at the derived amino acid level to ratified IsoA sequences. Finally, genes encoding the α-subunit of other SDIMOs such as sMMO, alkene monooxygenase or toluene monooxygenase from non-isoprene-degrading microorganisms (Additional file 1: Table S1) were also included in the alignment to guide the specific amplification of isoA genes by the new probes. Conserved positions within the isoA gene were identified and various sets of primers spanning different regions were manually designed (Additional file 1: Table S2; Figure S1). Eleven different combinations of primers were initially tested (Additional file 1: Table S3), including isoA14F and isoA1019R, which have been previously investigated . In this preliminary validation of the isoA probes, Rhodococcus sp. AD45 and Variovorax sp. WS9 were selected as representative Gram-positive and Gram-negative isoprene-degrading bacteria. Xanthobacter autotrophicus Py2 was chosen as a negative control since the α-subunit of its alkene monooxygenase is closely related to IsoA (70% amino acid identity to IsoA from Rhodococcus sp. AD45). Five out of the 11 combinations of primers tested yielded a PCR product of the expected size from the positive control strains, but there was no amplification from Xanthobacter autotrophicus Py2 (Additional file 1: Figure S2). Combinations isoA136F + isoA1019R, isoA300F + isoA1019R, isoA379F + isoA862R and isoA379F + isoA1019R also generated non-specific amplification products (Additional file 1: Figure S2). However, the combination of primers isoA14F and isoA511R, which spans the first iron centre of the IsoMO α-subunit (Additional file 1: Figure S1), yielded a specific PCR product of 497 bp. Therefore, we selected primers isoA14F and isoA511R for further validation on genomic DNA from additional isoprene-degrading and non-degrading isolates (Additional file 1: Table S4). A specific amplification product of the expected size was obtained for all 30 positive control strains used in this study. To check the cross-reactivity of the primers isoA14F and isoA511R, we used as negative controls 12 non-isoprene-utilising strains with related oxygenases to IsoMO that grow on alkanes, alkenes or aromatic compounds. Examples include bacteria containing sMMO (Methylococcus capsulatus Bath), toluene monooxygenase (Pseudomonas mendocina KR1) or alkene monooxygenase (Rhodococcus rhodochrous B276). We also studied as negative controls two strains that belong to the same genera as the bona-fide isoprene degraders Rhodococcus (Rhodococcus opacus DSM 1069) and Variovorax (Variovorax paradoxus EPS), but do not oxidise isoprene (Additional file 1: Table S4). No PCR products were obtained with the primers isoA14F and isoA511R with template DNA from any of the negative control strains. To check that the lack of amplification was not due to the quality of the DNA, a 16S rRNA gene PCR was performed and strong amplification products were obtained with DNA from all 14 negative control strains (data not shown). Therefore, we conclude that the primers isoA14F and isoA511R are specific for isoA encoding the α-subunit of the IsoMO and ratify that isoA is an excellent marker gene to determine if isoprene-degrading bacteria contain IsoMO. To test the specificity of the new isoA primer set and to investigate the diversity of isoA genes, and thus isoprene degraders in various environments, we enriched 11 samples from phyllosphere, soils, freshwater and marine environments with isoprene (Additional file 1: Table S5). DNA extracted from these enrichments was subjected to PCR amplification with the isoA primer set isoA14F and isoA511R. A single PCR product of the correct size (497 bp) was obtained with all the enrichments. To confirm that these PCR products contained only isoA genes, before committing to high-throughput sequencing of isoA amplicons, 9 out of the 11 enriched environmental samples were selected to construct isoA libraries from purified PCR amplicons. Sixty-nine clones from these isoA libraries were sequenced (Additional file 1: Table S5). Bioinformatic analysis using BLASTx  confirmed all sequences as isoA genes as they had an identity of 84–100% at the derived amino acid level to IsoA from bona-fide isoprene degraders and were ≤ 70% identical to other α-subunits of closely related SDIMOs that are not IsoMO such as the alkene monooxygenase from Xanthobacter autotrophicus Py2. The diversity of isoA sequences in DNA extracted from enriched samples from leaves varied according to the type of tree sampled. For example, isoA genes from ash leaf enrichments were similar to isoA from Rhodococcus, whereas isoA genes from oil palm leaf samples were phylogenetically close to isoA from Gordonia (Fig. 2). It was not surprising to find Rhodococcus isoA homologues in leaf enrichments, as several isoprene-degrading bacteria from this genus have been obtained from poplar, willow, oil palm and horse chestnut leaves [35, 36, 38]. In addition, Gordonia strains able to grow on isoprene have been previously isolated from an estuarine environment and oil palm leaves [31, 38]. Most of the isoA sequences retrieved from soils were phylogenetically close to isoA from Variovorax, although Rhodococcus isoA homologues were also found in DNA from tyre dump soil enrichments (i.e. tyre dump soil clone 14; Fig. 2). Variovorax strains are common inhabitants of soil and water [48–50], and are frequently associated with the phyllosphere [51, 52] and rhizosphere [53, 54] of plants. Indeed, some species of this genus, such as Variovorax paradoxus, are considered plant growth-promoting rhizobacteria that exert beneficial effects on plant growth . Variovorax species are metabolically versatile bacteria that can degrade a wide range of natural and xenobiotic compounds such as alkanesulfonates, polychlorinated biphenyls or trichloroethylene . Larke-Mejía  has shown that two novel Variovorax strains, isolated from soil surrounding a willow tree can grow on isoprene. The presence of Rhodococcus isoA homologues in soil collected from a tyre dump site is consistent with the recent isolation of isoprene-degrading Rhodococcus strains from these samples . In freshwater sediment enrichments, the predominant isoA sequences were phylogenetically closer to isoA from Rhodococcus, though sequences similar to isoA from Sphingopyxis were also present (i.e. freshwater sediment clone 5; Fig. 2). In fact, Rhodococcus sp. AD45, the most well-characterised isoprene degrader, was isolated from freshwater sediment . Sphingopyxis is a genus commonly associated with the phyllosphere [51, 52], although Sphingopyxis species have also been isolated from soils, freshwater and seawater samples [56–59]. It was not until the isolation of Sphingopyxis sp. OPL5 , however, that members of this genus were shown to metabolise isoprene. Finally, in salt marsh sediment enrichments, only isoA sequences from Rhodococcus were found, whereas enrichments with coastal sediment yielded more diverse isoA sequences, with both Rhodococcus and Variovorax isoA-like genes being obtained from the clone libraries (i.e. coastal sediment clones 4 and 5; Fig. 2). Indeed, the presence of Rhodococcus isoA homologues in marine environments has been confirmed with the recent isolation of two isoprene-degrading Rhodococcus strains from salt marsh and coastal sediments (unpublished data). Since the sequences obtained from the clone libraries were specific to isoA and showed variability within and across the different ecosystems studied, we explored in more detail the diversity of isoA genes in the environment using high-throughput sequencing. Purified isoA PCR products from DNA isolated from 11 enriched environmental samples were sequenced using Illumina MiSeq technology (Additional file 1: Table S5). isoA amplicon sequencing yielded a total of 136,986 quality-filtered sequences with an average of 12,453 reads per sample. These isoA sequences, when analysed by the DADA2 pipeline , grouped into 136 unique operational taxonomic units (OTUs) that were manually checked by BLASTx (see Methods). Two OTUs, representing 0.3% and 2.5% of the sequences from DNA extracted from enriched poplar leaves and freshwater sediment, respectively, were discarded for the analysis as they had hits to proteins not related to IsoA or other SDIMO α-subunits. Therefore, a final set of 134 OTUs was used for downstream analysis (Fig. 3; Additional file 2: Table S6). The isoA amplicon sequencing analysis revealed that the phyllosphere yielded most variability between samples when compared to other environments (Fig. 3). For example, 99.8% of the isoA sequences from ash leaf enrichments were similar to isoA from Rhodococcus. isoA genes similar to those of Gordonia and Mycobacterium were also found, although at low relative abundance (< 1%). 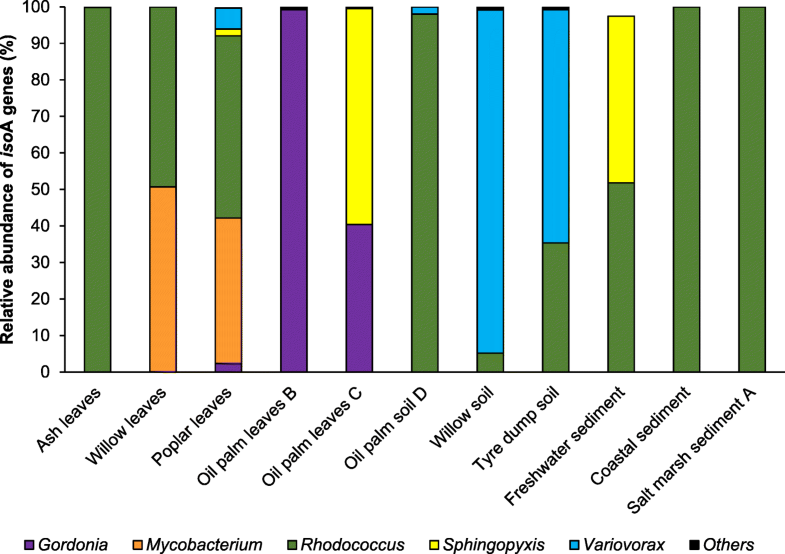 Conversely, DNA from oil palm leaf enrichments yielded predominantly Gordonia and Sphingopyxis isoA homologues, even though isoA genes from Rhodococcus and Mycobacterium were also present (< 1%). Indeed, we have recently isolated isoprene-degrading Gordonia and Sphingopyxis strains from oil palm leaves . 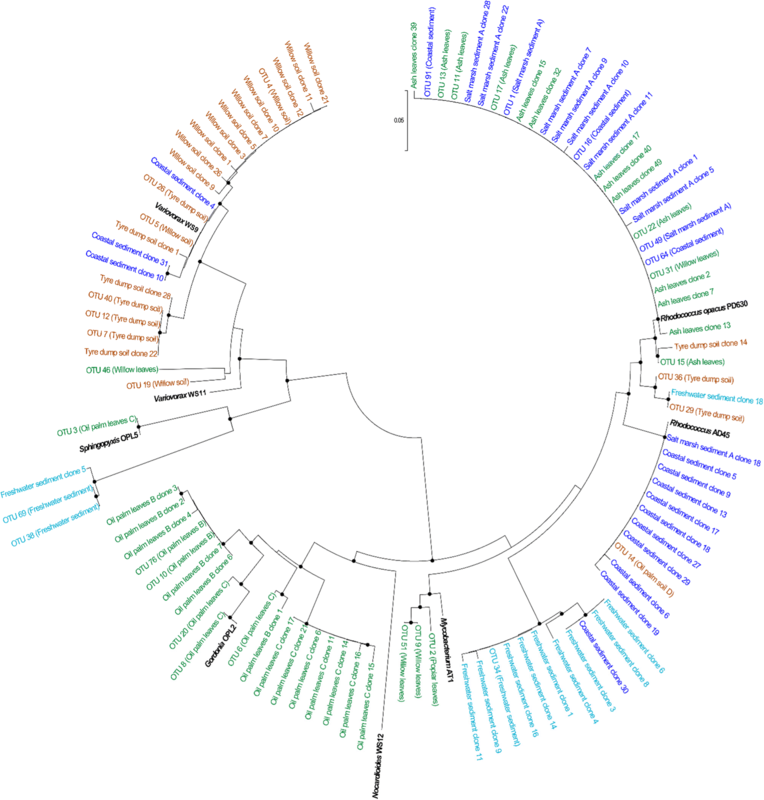 The predominant sequences in willow leaf enrichments were phylogenetically close to isoA from Mycobacterium (50.7%) and Rhodoccocus (49.3%). Finally, poplar leaf enrichments yielded more phylogenetically diverse isoA genes, with homologues to isoA from Gordonia (2.3%), Mycobacterium (40%), Rhodococcus (50%), Sphingopyxis (1.9%), and Variovorax (5.8%, Fig. 3). Although these genera are common inhabitants of the phyllosphere and soils [50, 51, 54, 61], no Variovorax or Mycobacterium strains from leaves able to metabolise isoprene have been reported so far. The most abundant isoA sequences identified in willow, oil palm and tyre dump soil enrichments were similar to Rhodococcus and Variovorax isoA genes (Fig. 3). isoA sequences from Mycobacterium, Nocardioides and Sphingopyxis were also detected in willow soil (< 1%). Sequences similar to isoA from Gordonia, Mycobacterium and Sphingopyxis were present at low relative abundance (< 1%) in DNA extracted from tyre dump soil. These results are consistent with the isolation of Nocardioides, Rhodococcus and Variovorax isoprene-degrading strains from willow and tyre dump soils [35, 38]. Finally, isoA homologues from Sphingopyxis (46.8%) and Rhodococcus (53.2%) dominated DNA from freshwater sediment enrichments, whereas isoA sequences retrieved from coastal and salt marsh enriched samples had highest identity to isoA from Rhodococcus (Fig. 3). In addition, several sequences were distinct from those of isoA of bona-fide isoprene degraders, indicating that there is likely novel diversity of isoprene-utilising bacteria yet to be discovered. For example, most of the isoA clones and OTUs originating from enriched freshwater sediment samples (i.e. freshwater sediment clones 5 and 8; OTUs 34 and 38) occupied a distinct position in the IsoA phylogenetic tree as shown in Fig. 2. BLASTx analysis of these sequences revealed that they had 83–91% identity at the derived amino acid level to IsoA from extant isoprene degraders of the genera Rhodococcus and Sphingopyxis, suggesting that this environment harbours novel isoprene-utilising strains. The sequencing information obtained using the new isoA probes isoA14F and isoA511R can now be used to design targeted enrichment and isolation strategies to isolate novel species of isoprene degraders from various environments and expand the diversity of existent isoprene-degrading bacteria. isoA primer set isoA14F and isoA511R was used to study the distribution and abundance of isoA-containing bacteria using qPCR. isoA primers were first optimised and validated on DNA extracted from environmental samples enriched with isoprene (Additional file 1: Figure S5). Subsequently, clone libraries from qPCR products obtained from both enriched and natural (non-enriched) environmental samples were constructed to ensure that isoA qPCR products were absolutely specific for isoA. Fifty-two clones from these isoA libraries were sequenced. All sequences had 89–100% identity at the derived amino acid level to IsoA from bona-fide isoprene degraders and were ≤ 70% identical to other α-subunits of closely related SDIMOs that are not IsoMO such as the alkene monooxygenase from Xanthobacter autotrophicus Py2. After qPCR assay validation, the abundance of isoprene degraders across a wide range of natural samples, including leaves, soils, freshwater and marine sediments was studied. Interestingly, leaves from high isoprene-emitting trees such as willow, poplar and oil palm [62, 63] contained similar isoA numbers as those from an ash tree, a low isoprene emitter (between 11.6 ± 3.6 and 23.7 ± 6.1 isoA genes per million copies of 16S rRNA gene in DNA extracted from high isoprene-emitting trees, versus 22.4 ± 5.6 isoA genes per million copies of 16S rRNA gene in DNA from ash leaves; Fig. 4). However, a larger number of environmental samples will be required to confirm statistically that there are no significant differences in the abundance of isoprene degraders between high and low-emitting trees. Moreover, soils sampled in the vicinity of high isoprene-emitting trees yielded the highest numbers of isoprene degraders (with values ranging from 122.2 ± 5.0 to 303.3 ± 60.3 isoA genes per million copies of 16S rRNA gene; Fig. 4). The fact that there were 10-fold more isoprene degraders in soils than in the leaves of the same trees could be explained by the flux of bacteria from the phyllosphere to the pedosphere during rainfall, which has been estimated to be up to 1.5 × 1016 cells ha−1 year−1 in a subtropical oak-cedar forest . It was not surprising to see relatively high numbers of isoA genes (67.7 ± 14.4 isoA genes per million copies of 16S rRNA gene) in soil sampled from a tyre dump, since tyres mainly consist of polyisoprene rubber [65, 66]. Although several bacteria and fungi can degrade polyisoprene rubber [67, 68], some studies have suggested that actinomycetes are the key microorganisms carrying out this process [69–72]. The cleavage of polyisoprene rubber by Lcp and RoxA oxygenases results in the production of oligoisoprene molecules  that could potentially be used by the isoprene degraders for growth. Indeed, rubber-contaminated soils have yielded isoprene-utilising bacteria from different genera, including Rhodococcus [38, 74], although these strains were not characterised in detail. Grassland and landfill soils also contained isoprene degraders, although at lower relative abundance (from 12.4 ± 1.3 to 25.4 ± 2.8 isoA genes per million copies of 16S rRNA gene) than soils surrounded by high isoprene-emitting trees, as anticipated (Fig. 4). The presence of isoprene-degrading microorganisms was also studied in freshwater and marine natural samples. Surprisingly, these samples yielded similar copy numbers of isoA genes (ranging from 12.0 ± 1.9 to 25.1 ± 2.8 isoA copies per million copies of 16S rRNA gene) as leaves (Fig. 4). This was unexpected since isoprene emissions from marine environments (0.1–12 Tg year−1) [2, 11, 16] are very much lower than from terrestrial plants (500 Tg year−1) [2, 9]. In marine environments, isoprene is synthesised by phytoplankton, heterotrophic bacteria and seaweeds . However, only a few studies have directly measured the isoprene concentration in the euphotic zones of the oceans and the exact mechanism behind marine isoprene production is still unknown . Another poorly understood aspect of the marine isoprene cycle is the role of microbial degradation. Ocean depth profiles of isoprene concentrations have suggested that isoprene is biologically consumed [75–78]. Indeed, Acuña Alvarez et al. and Johnston et al. found isoprene-degrading bacteria in estuarine and marine water samples, most of which were Actinobacteria. More importantly, Acuña Alvarez et al. also showed that isoprene-utilising bacteria degraded isoprene from the headspace of microalgae cultures at environmentally relevant concentrations. A recent study by Steinke et al. has reported that freshwater lakes also emit isoprene to the atmosphere. Therefore, additional laboratory experiments and field studies as well as more accurate models are required to better understand the isoprene cycle in marine and freshwater environments. Although we cannot exclude the possibility that isoA genes from novel uncultivated isoprene-degrading bacteria have been missed, or that other pathways of isoprene metabolism exist, new probes targeting the isoA gene encoding the active site of the IsoMO have proven to be a successful tool to study the diversity, distribution and abundance of isoprene degraders in a wide range of environments. This now facilitates the development of targeted strategies to isolate novel genera of isoprene degraders, monitor them under natural conditions and to determine how isoprene degradation is regulated in the environment. This study provides molecular probes to investigate the significance of the isoprene biological sink and how bacteria might mitigate the effect on the atmosphere of this abundant climate-active gas. To study the distribution, abundance and diversity of isoprene degraders in the environment, a wide range of terrestrial, phyllosphere, freshwater and marine samples were collected (Additional file 1: Table S5). 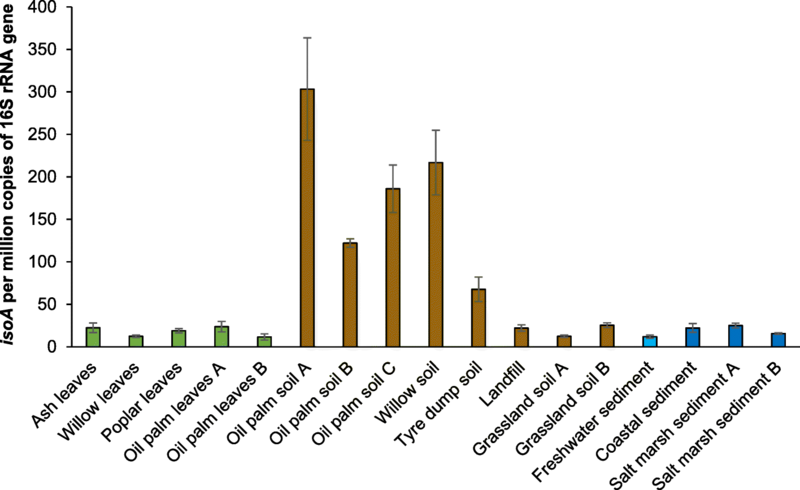 Terrestrial samples comprised soils from the vicinity of high isoprene-emitting trees (oil palm and willow) and soils without nearby high isoprene-emitting vegetation (grassland and landfill soils). Soil from a tyre dump was also studied since several isoprene-degrading strains have been isolated from rubber-contaminated soils [38, 74]. Samples from the phyllosphere included leaves from high isoprene-producing trees as for example, willow, poplar and oil palm, and low emitters such as ash trees. Freshwater samples were collected from a local lake. Samples from marine environments consisted of coastal and salt marsh sediments (Additional file 1: Table S5). In the case of soils, freshwater and marine sediments, only the top 3 cm were collected after removing vegetation or macroscopic algae. Further, 1 g of material was used to set up microcosm enrichments in 120 ml sealed vials containing 10 ml of water for soils, Ewers medium  for freshwater sediments or marine basal medium (MBM)  for marine samples. Salinity of MBM was adjusted to 20 practical salinity units (PSU) in coastal sediment samples and to 35 PSU in salt marsh sediments to mimic natural conditions. The surface of 3–10 leaves from each tree (depending on leaf size) was sampled by washing leaves with Ewers medium or using cotton swabs. For leaf washings, leaves were immersed in 50 ml of Ewers medium in 250 ml conical flasks and submerged in a water bath for sonication (5 min, 50 kHz; Mettler ME2), followed by shaking on an orbital shaker (1 h, 150 rpm) to detach microbial cells from the surface of the leaves. Leaves were then removed from the flasks and medium was centrifuged (5000×g, 20 min) to separate cells and particulate material from the supernatant. Supernatant was filtered through CellTrap CT402LL001N00 filters (Mem-Teq). Pellets of cells and particulate material were combined with the filtrated supernatant, resuspended in 10 ml of fresh minimal medium and transferred to 120 ml sealed vials. When leaf surfaces were sampled with cotton swabs (ash leaves and oil palm leaves C), the swabs were placed in 250 ml conical flasks containing 50 ml of Ewers medium and sonicated in a water bath as above. After shaking in an orbital shaker for 1 h at 150 rpm, cotton swabs were removed and medium was aliquoted into 120 ml sealed vials. All enrichments were set up in triplicate and incubated at 25 °C with 25 ppm isoprene, except for oil palm leaf samples from Malaysia, which were incubated at 30 °C with 50 ppm of isoprene. Consumption of isoprene was monitored daily by gas-chromatography as described in . When isoprene was depleted in the headspace, samples were spiked again with 25 ppm of isoprene or 50 ppm in the case of oil palm leaf samples from Malaysia. Enrichments were subcultured at 2-week intervals three times by making 1/10 dilutions of the samples in fresh medium. Genomic DNA from positive and negative control strains was extracted from cultures grown in rich media using the Wizard Genomic DNA Purification Kit (Promega), according to the manufacturer’s instructions. To extract DNA from environmental samples, the FastDNA™ SPIN kit for Soil (MP Biomedicals) was used following the protocol described by the manufacturer. Fifty nanograms of genomic DNA or 20 ng to 1 μg of environmental DNA were used as a template in a 50 μl PCR reaction containing 4 μM of isoA14F (5′-GVGACGAYTGGTAYGACA-3′) and isoA511R (5′-TCGTCRAAGAARTTCTTBAC-3′) primers. The PCR program consisted of an initial step of 94 °C for 2 min, followed by 31 cycles of 95 °C for 15 s, 54 °C for 30 s, 72 °C for 1 min and a final extension step of 72 °C for 7 min. In the case of freshwater and marine DNA samples, 40 cycles were carried out to obtain an amplicon visible on an agarose gel stained with ethidium bromide. isoA PCR products from environmental samples were purified using the NucleoSpin gel and PCR Clean-up kit (Macherey-Nagel) and cloned into the pGEM®-T easy vector system (Promega) following the manufacturer’s instructions prior to transformation into Escherichia coli TOP10 cells. Positive clones were screened by PCR using the M13F and M13R primers. Clones yielding a PCR product were sent for sequencing using M13 primers. Duplicate PCR products from each environmental sample were pooled before DNA purification using the NucleoSpin gel and PCR Clean-up kit (Macherey-Nagel). The quality of DNA was assessed by gel electrophoresis and the Qubit dsDNA High Sensitivity Assay Kit (ThermoFisher) according to the manufacturer’s instructions. Purified isoA amplicons from enriched environmental samples were subjected to Illumina Mi-Seq sequencing by MrDNA (Shallowater, TX, USA) using an Illumina MiSeq platform. isoA amplicon sequencing data were analysed using DADA2 pipeline  with default filtering parameters. Reads were truncated at 275 nucleotides and quality-filtered if their expected error was higher than two. After denoising the sequences using the estimated error rates, forward and reverse reads were merged. Resultant sequences were screened for chimeras and then manually checked by BLASTx . Those OTUs with a top hit distinct from a ratified IsoA sequence were discarded, obtaining a final set of 134 unique OTUs for downstream analysis. Quantification of isoprene degraders in environmental samples was estimated by qPCR targeting the isoA gene using primers isoA14F and isoA511R (Additional file 1: Table S2). qPCR assays were carried out using a StepOne Plus real-time PCR instrument (Applied Biosystems). qPCR reactions (20 μl) contained 2–20 ng of DNA, 400 nM of each primer and 10 μl of SensiFast SYBR Hi-ROX kit (Bioline). The qPCR reaction consisted of an initial denaturation step at 95 °C for 3 min, followed by 40 cycles of 95 °C for 20 s, 60 °C for 20 s and 72 °C for 30 s. Data were acquired at 88 °C for 15 s to avoid quantification of primer dimers. Specificity of qPCR reactions was determined from melting curves obtained by increasing the temperature in 0.3 °C increments from 60 to 95 °C, followed by gel electrophoresis and clone library construction from several qPCR products. The copy number of isoA genes was determined from qPCR of ten-fold dilution series (100–108 copies per μl) of DNA standards (Additional file 1: Figure S4). Standards were prepared by cloning the isoA gene of Rhodococcus sp. AD45 into the pGEM®T Easy vector (Promega) and using this as template DNA. The detection limit of the isoA qPCR assay was 102 copies per 20 μl reaction. Finally, isoA copies were normalised to 16S rRNA gene copy number in order to estimate the abundance of isoprene degraders in different environmental samples. Number of copies of 16S rRNA genes was determined by qPCR using 519F and 907R primers . Reactions (20 μl) contained 10–70 pg DNA, 400 nM of each primer and 10 μl of SensiFast SYBR Hi-ROX kit. The qPCR reaction consisted of an initial denaturation step at 95 °C for 3 min, followed by 40 cycles of 95 °C for 20 s, 55 °C for 20 s and 72 °C for 30 s. Data collection was performed at 72 °C for 15 s. Specificity of the qPCR reaction and quantification of 16S rRNA gene copy number were determined as above. We thank Elizabeth Wellington and Ian Lidbury from the University of Warwick for importing soils from Malaysia to their laboratory and extracting DNA. We also thank Mohd Shahrul Mohd Nadzir from the National University of Malaysia for providing oil palm leaves and soil samples. We thank Nick Coleman, Scott Ensign and Greg Whited for providing bacterial strains (Mycobacterium chubuense NBB4, Xanthobacter autotrophicus Py2 and Pseudomonas mendocina KR1, respectively) to validate the isoA probes. We thank Paul Wilmes for advice on isoA amplicon sequencing analysis. We thank Andrew Crombie and Jonathan Todd for insightful comments on the manuscript and Robin Dawson, Colin Lockwood, Simone Payne and Leanne Sims for useful scientific discussions. The work on this project was funded through an ERC advanced grant to J.C.M. (694578—IsoMet), Natural Environment Research Council (NERC) grants to J.C.M. (NE/J009725/1) and T.J.M. (NE/J009555/1), a Colombian Government Scholarship (No. 646, Colciencias/Newton Fund (2014)) to NLLM and the Earth and Life Systems Alliance (ELSA) at the University of East Anglia. isoA amplicon sequencing data generated in this study were deposited to the sequence read archives (SRA) under Bioproject PRJNA272922 (Biosamples SAMN10345540-SAMN10345550). Clone library sequence data were deposited to NCBI Genbank under accession numbers MK176357 to MK176478. OCF, TJM, NLLM and JCM planned the experiments. OCF, LG and NLLM carried out the experimental work and analysed results. MFUH planned and analysed qPCR experiments. JRG conducted isoA amplicon sequencing analysis. OCF and JCM wrote the manuscript with contributions from all authors. All authors read and approved the manuscript before submission. Shaw SL, Gantt B, Meskhidze N. Production and emissions of marine isoprene and monoterpenes: a review. Adv Meterol. 2010;2010:408696. https://doi.org/10.1155/2010/408696.